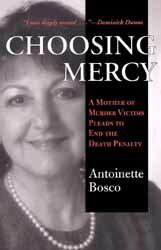 Choosing Mercy, A Mother of Murder Victims Pleads to End the Death Penalty, has been selected as a 2002 Christopher Award winner. "to change the world for good,"
In what has to be more than just a coincidence, achieving those goals has always been my motivation in writing my books, precisely because of the inspiration I got from the founder of the Christophers, Father James Keller. He was one of the first assembly speakers at The College of St. Rose in Albany, N.Y. when I was a Freshman at this then all-girls college shortly after the end of World War II. He was there to motivate us young women to think about the good we could do in choosing a life's work. He was energetic, fired up and convincing as he enthusiastically told us - "You can change the world!" And he mentioned three professions that were crucial for making changes in our world for the better--politics, teaching and writing. That day he sowed the seed in me that took root and led me to be a writer so that I could "change the world". He believed it is "better to light one candle than to curse the darkness". To prove this, he had each of us light a candle, one by one. At first, the light could hardly be seen. But by the time the 500 of us there had each lit a candle, the auditorium was well lit up. He had made his point. Well, clearly, I haven't changed the world! But maybe I have made a little difference by lighting my one candle.